Just had to pick up Craig Thompson’s graphic novel Blankets when I saw it at Full Circle in Greater Kailash. I have it on DVD, but it’s difficult to read a big book for the first time on a computer screen (tactile experience, convenience, etc). Haven't regretted it. This is a gentle, elegiac, beautifully illustrated work, well worth investing time and money into. A semi-autobiographical story, Blankets moves between two phases of the narrator Craig’s life: his childhood days, sharing (and squabbling over) a single bed with his kid brother Phil; and his years as a confused adolescent, finding some comfort in an intense but fragile relationship with a girl named Raina. Through all this, Craig struggles with questions about religion, art, the ephemeral nature of our existence on earth (and whether it will be followed by something more rewarding), the importance of family and the difficulty of achieving genuine closeness with another person. A loner, he feels dissociated from most people around him and struggles in vain to stay rooted to something. Growing up in a staunchly Christian family, taught at Sunday school that God can properly be worshipped only by singing His praises, not by drawing pictures, he becomes concerned that his passion for drawing might amount to blasphemy; he burns all his artwork, but this doesn’t bring him the peace of mind he was hoping for. 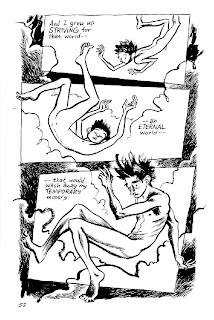 According to the Wikipedia entry on Craig Thompson, the idea for Blankets came out of his wanting “to describe how it feels to sleep next to someone for the first time”. This idea – seeking comfort, however fleetingly, in someone else’s physical presence – runs through the book: initially Craig and Phil resent having to share a small bed, but when they are finally put in separate rooms they quickly find excuses to get back together. Craig and Raina’s relationship is marked by their finding ways to spend the night together, or just to lie down next to each other (even before their relationship becomes sexual). Blankets are integral to the story too – the brothers fight over them in winter and push them away in the muggy Wisconsin summers, and later, Raina gifts Craig a richly patterned quilt she made herself, which becomes a symbol of the bond between them. There are many things to say about this detailed book – for instance, I could observe that the overused phrase “deceptively simple” is an apt description of it. Despite frequently cutting between the past and present, the narrative is straightforward, in traditional story-book style. 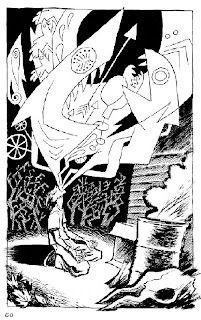 And though many of the drawings are outstanding studies in characters’ expressions and little pauses in conversations, the storyboarding is not especially experimental; Blankets doesn’t demand the rigorous concentration that one needs while reading a graphic novel conceptualised by, say, Alan Moore – where many different layers of meaning often coexist within a single panel. But this is no simple picture-book either. Look at the drawings more closely (preferably after having read the book once, so that the plot is no longer in the way) and you’ll appreciate how effectively they depict Craig’s interior life, his sense of isolation. 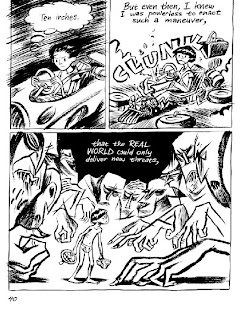 The artwork is often quite complex in terms of prefiguring, in the way the characters are positioned in relation to each other, and the visual connections between panels. Small example: two panels, 450 pages apart, show Craig entering the house, saying “Hey, Phil” to his brother and eliciting a lazy “Hey” in response. In the first of these panels, they are children and Phil is reclining on the couch watching Tom and Jerry; in the second, they are young men, with Phil again absorbed by the TV, but playing on his Playstation this time. The two panels contain shared associations – this is the same house where the brothers grew up, and the same room, many years apart – but also indicate how much their relationship has changed over time (Craig and Phil are so much a part of each others’ lives in the childhood sections that it comes as a shock when, after a few chapters that focus on the adult Craig’s relationship with Raina, we see the grown-up Phil and realise that the siblings are now aloof, brooding teens, speaking in monosyllables to each other). Thompson’s depiction of the hegemony of adults, and how threatening the world can be for sensitive children, reminded me of one of my favourite books from last year, David Mitchell’s Black Swan Green (a related post here). Mitchell’s novel, about a year in the life of a young boy, Jason, growing up in an English village in the early 1980s, drew some criticism for being too simple, and a “throwback” from the complex narrative techniques he employed in his earlier books. But there was a lot going on under its placid surface: each chapter, written in a subtly different style from the others, was a vivid portrayal of a child’s inner life and the story, coloured as it was by Jason’s fantasies, couldn’t always be taken at face value. Blankets has a similar effect in places. 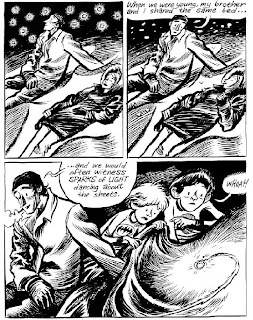 I liked Thompson’s evocation of the magic that exists in a child’s world, which adults turn into something mundane (Craig and Phil are excited by the sparks of light – fairies? Tinkerbell? – they see in their room late at night, but their parents coolly inform them that it’s merely static electricity). And early on, when the boys’ father punishes them by making little Phil spend the night in a dreaded hidden room called the “cubby hole”, he is depicted as an imposing, outsize authority figure. 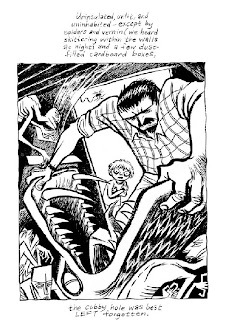 When Mr Thompson snaps open the elastic bed in this room, the image is a surreal one straight out of the boys’ nightmares: there are demons lurking in the cubby hole’s dark corners and the bed takes the form of a primeval monster, jaws agape, waiting to sink its giant teeth into poor Phil. Of course, when we see Craig and Phil’s parents much later in the book, they don’t seem threatening anymore; we understand that they aren’t the fiends (or even the apathetic slouches) that the early chapters suggested, just simple, conservative folk making the best of difficult circumstances. But the cubby-hole image is powerful enough for us to appreciate how Craig's life has been coloured by these early experiences. P.S. Thompson's official website is here. Hmmm .... kind of reminds me of Chester Brown's "I never liked you" ( and "Louis Riel" - for the artwork ). 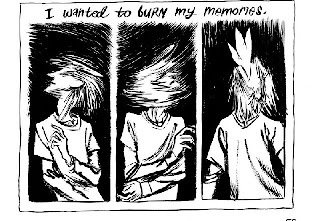 Now I'm quite convinced I should read graphic novels. thanks. Wasn't very impressed with Blankets. The artwork is excellent, & the b&w illustrations effectively capture the bleakness of the American midwest. But the story is rather sappy, like a whiny US indie movie. 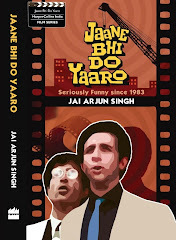 Interestingly, it did remind me of Ray's Apu Trilogy, in its 'life' arc, except the fatherhood & big city part. Chris Ware & Daniel Clowes are far ahead of him. Don't stop there. Get Goodbye Chunky Rice and his France / Morocco travelogue Carnet de Voyage. The latter was a research trip for his upcoming book Habibi. Re sappiness: Considering the inherent sappiness of the theme, I felt he handled it quite tastefully. I have been buying my graphic novels from this Indian site. Has a pretty decent collection. Read the book and loved it! However, I don't quite understand what happend in the end... did Craig realize that Raina was simply using him or was he ready to move on? I felt like at the end of the novel he realizes that Raina is not the angel he thought her to be (instead she is just as subject to human nature as the rest of us) and he realizes to a certain extent that their relationship was beautiful and consecrated, but fleeting and superficial as well.